Unlike our own Zoe Chevat and Jill Pantozzi, I was actually very happy with Star Trek Into Darkness overall. Having been a Trekkie for as long as I can remember, I understand that it doesn’t have the philosophical weight of some past Trek stories, as well as the contention that it heavily recycles old characters and plot points. But personally I look at the “Abramsverse” as a complete remake, and my view of the new films is that they’re made differently but extremely well. That’s not to say that I don’t agree with the gender issues-related criticisms of the film. The now-infamous Carol Marcus undressed scene was, to be sure, gratuitous, offensive and completely inexcusable. 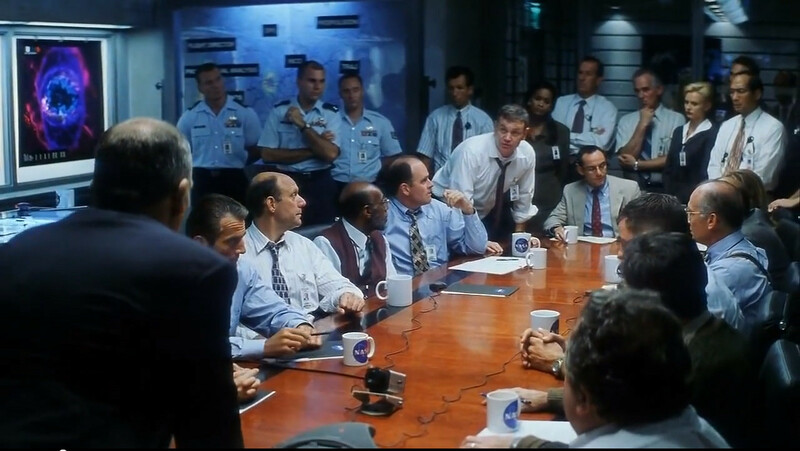 I was equally disappointed by the scene of a Starfleet Command roundtable which shows a 20-person group that’s between 70-75 percent male. But where equality appears even farther away, in Hollywood as a whole, is among another realm of film characters: villains. Allow me to use the two J.J. Abrams Star Trek films as examples. There are no female members of the U.S.S. Vengeance crew. There were no female members of Nero’s crew in the 2009 film. Although it’s hard to tell for certain since most were wearing masks, it didn’t look like there were any female Klingons in Into Darkness‘ Kronos scene. (To be tangentially honest it was the aforementioned Starfleet Command scene that stuck with me most of the movie. Given that most of the Enterprise crewmembers the series focuses on are male, this would have been an easy opportunity to counteract that at least briefly, and to make a simple statement on the future of gender equality in power positions. Obviously, the filmmakers completely blew it. The lack of female “bads” isn’t universal – for instance, there was the memorable (though brief) appearance of Ellen Brandt in Iron Man 3. But it’s clear that, as meager as the attempt to include “good” female characters in movies is overall, even less consideration is given to including women in antagonist roles. I feel like filmmakers are thinking, “why does it matter if there are female antagonists – it’s not like a villainous character makes women look good.” And while this might be true in the simplest sense, it misses the bigger point. Having female characters in films shouldn’t be about getting in a few nice, positive moments for women and then calling it a day. It should be about naturally having an equal distribution of genders in film roles. There’s no question it’s important that there be positive female role models in movies. But I’d hope such characters come about not because writers are purposefully trying to check a “strong female character” box and then move on, but because they’re writing female characters that span the range of cinematic possibility as often as they do for male characters. Of course none of this is to mention the possibility of having a woman be the main villain of a movie, which is almost unheard of in films with male heroes, with exceptions like Dredd or Indiana Jones and the Kingdom of the Crystal Skull being few and far between. (And no, Jurassic Park does not count.) But it would be nice if, for instance, any of the numerous big summer male-fronted superhero films ever dug into the well of female supervillains for their big bad. One reason filmmakers might be wary of this idea is that they’re afraid of the optics of a male hero hurting a female villain, given the prevalence of real-world male violence against women. If physical confrontation between hero and villain is absolutely crucial, it’s hard to deny the possibility that the imagery of domestic violence or sexual assault could be evoked. The prevalence of these crimes is, of course, reprehensible on its own. It’s a lesser but still unfortunate side effect that a domain like the escapist fantasy world of film can be affected by their tragic normalcy. And – because it creates a class of characters that can only be male – in a way that serves to marginalize women, no less! That’s one example, of many, of how the different forms of marginalization of women can be interconnected and perpetuating of each other. And besides, I feel pretty sure the film that culminates in a bloody mano-a-mano showdown between hero and villain is the exception rather than the rule these days anyway. That’s one reason I’m confident that the majority of recent villains could have been genderswapped without any troubling associations being created at all. Another reason I say that is that the days of underdeveloped villains with few discernible traits but wickedness are mostly behind us, when it comes to well-regarded films at least. Even an unequivocally evil character like Voldemort received a fair deal of humanizing backstory. Most villainous characters will have defenders in fandom, and many have their downfalls slanted as more tragic or anti-heroic than simply an all-around horrible person getting their due. So I don’t think one can validly make the excuse that there is something inherent about a villain’s character that would be inappropriate to assign to a woman. For instance, I’ve heard the argument that filmmakers want to avoid the femme fatale-style archetype whose villainous traits might just be thinly-veiled critiques of female power and/or sexuality. Though the overall effort is clearly still inadequate, filmmakers these days are usually savvy enough to at least give lip service to the idea of having female characters in their films. It’s time they realized that that should mean all types of characters, on the good-to-evil spectrum and otherwise. Dan Wohl blogs about baseball for a living, and he also has been telling anyone who will listen lately that the primary villain in the next Star Trek film should be a Klingon played by uber-Trekkie Rosario Dawson. He would love for you to follow him on Twitter: @Dan_Wohl.